India's manufacturing Exports - Does exchange rate matter? There was an interesting working paper published by NIPFP recently on the topic "Does weak Rupee matter for India's manufacturing exports?" You can find the abstract here, and the pdf of the full paper here. 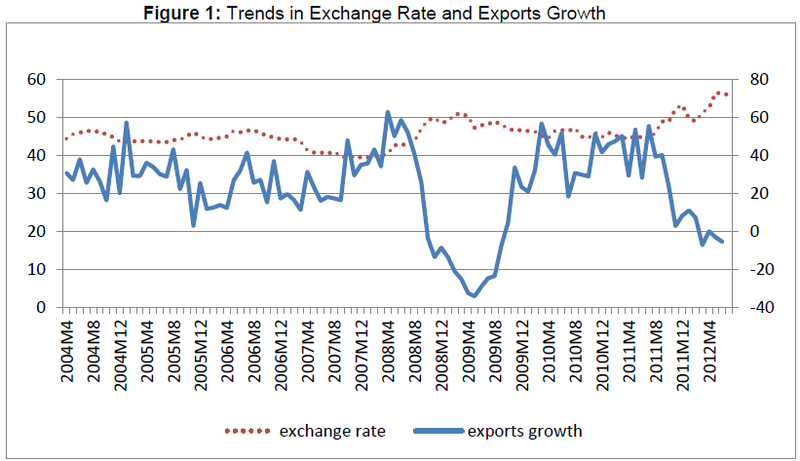 Exchange rate movement doesn't have any positive correlation with exports. In fact, the correlation coefficient is negative, indicating an unconventional result that stands on the head of traditional understanding of weak exchange rate boosting exports. The paper suggests that when the exchange rate depreciates, exports fall, contrary to the traditional expectations. The Indian exports growth is imports led, as there is a good positive corrleation with imports and exports growth. Therefore, the paper argues in favor of encouraging imports and concentrating on sectoral policies to boost exports rather than thinking about exchange rate effects. In the light of above, the paper recommends that policy makers should not aim at weak exchange rate to boost exports. In author's words "direct impact of exchange rate movement on export performance is weak, therefore, using exchange rate intervention root(sic) for achieving export growth is not a suitable policy option for the Indian economy. Rather it might end up in showing unintended outcomes." I will talk about policy options later, but let me first disagree with the macro result. Exchange rates do not seem to effect merchandise trade in the way the paper proposes. The paper seems to have ignored the lag effect. Let me illustrate it through some self-explanatory plots. Firstly, here's the plot from the paper, based on RBI data. It has a correlation coefficient of -0.56 as claimed by the authors. The above plot has a correlation coefficient of -0.58 which agrees with that of the paper. Now we shall introduce the lag effect of exchange rates. I will shift the exchange rate by 6 months, 8, 10, 12 and 15 months. Basically, what I have done is, keeping exports growth numbers at same place, I have taken the monthly exchange rate that belonged to a period 6, 8, 10 (and so on) months before the period and superimposed it. The correlation coefficient (marked on the plots near top left) changes from -0.58 (negative) to + 0.58 (positive). You can see the lag effect in play in the following graphs. Exchange rate has a positive correlation (+0.58) with export performance, with a lag effect of around 12 to 15 months.Causality is not implied, but it cannot be ruled out. Exchange rate seems to be one of the factors that influences exports. The results seem to indicate that our export performance with regard to exchange rate do not differ from traditional understanding of international economics, and weak exchange rate indeed appears to help exports. Now, the reason for the lag is something that's interesting. I guess that it is a combination of the way the trade data is reported in India and also to the way the manufacturing industries adjust to the dynamics of exchange rate movement . I have blogged about the data reporting stuff here. The data reported by RBI and that reported by DGCI&S differ due to various reasons as explained in my blog. One of them is the lag in forex realization (upto a year as per FEMA), for the export proceeds. Also, the manufacturing industry reacts with a lag to the exchange rate movement. If exchange rate changes today, it doesn't mean that all the invoices, work in progress and orders in process will react immediately. The price re-negotiation, hedging effects and adjustments to changing demand at new price, take time, and the true effect shows after some time. Finally, I agree with the paper on the point that sectoral policies with wholesome approach to trade development is more important than thinking about exchange rates. But then, there's nothing new in that. India doesn't have much of a say in managing exchange rate any longer. The intervention is only to adjust for volatility, and that control too, I suspect, is not very effective.